Várfok Gallery was one of the first privately founded galleries after the political changes of ’89 showing contemporary art in Hungary and it has been able to function continuously to this day. They stick to exclusively showcasing talented, Hungarian contemporary artists. I’ve visited them a couple of times for different exhibitions. The atmosphere they have created is homelike and delivers a professional art service to the audience. It’s just heaven for artistic souls, and open minded curious people, like me, can easily enjoy everything with some background information – which is always provided! The exhibitions are always well organised, supported by descriptions painted on the walls. The admission to the gallery and every exhibition is free. The exhibited works are also available for sale. During the opening times you can get some help from the staff, they are lovely! 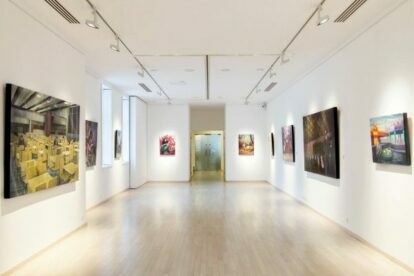 The gallery operates in the historical Buda Castle area, it’s a short walk from Széll Kálmán metro station. The Castle also served by bus (N.16) from Deák Ferenc square. Get off at the second to last stop called „”Mátray utca”. You can visit them from Tuesday to Saturday (11:00 – 18:00). They are a program-gallery so you can find more about forthcoming exhibitions on their website. Recommended for artists and for art lovers!